The Active Directory user configuration is typically created when a new user joins the enterprise and deleted when the user leaves. Active Directory user settings can now also govern which user and configuration items are configured on Cisco Unified Communications. Auto-Provisioning tracks any Active Directory user change, and then creates or deletes the end-user configuration on Cisco servers based on rules and templates. Changes to location attribute, names or assigned extension create provisioning jobs. Any system generated job can be approved by a site administrator before being executed. This allows to fully manage standard Cisco UC configurations via Active Directory, leading to 98% reduction in manual provisioning. The system also supports automated emails to end-users including, log-in details and training material. 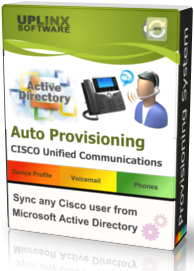 Any combination of Cisco phones, device profiles, Jabber, softphones, RDPs, presence and voicemail configurations, for all end-users on Cisco Unified Communications, can be effortlessly managed by UPLINX Auto Provisioning.